Vintage Christmas Double Bill at the Majestic. I came across this quite by chance and thought what a wonderful double bill this is – at the Majestic Cinema Kings Lynn – where apparently they hold these special events from time to time – and are always a sell-out. In this case ‘Its a Wonderful Life’ is back by popular demand - NO surprise to anyone I would think. This Christmas we have two fantastic Vintage Cinema evenings for you to enjoy! First on Sunday 14th December we will be showing Miracle on 34th Street starring the late Richard Attenborough. The film will be shown in 35mm which is an extreme rarity in this day and age! Then on Saturday 20th December we will be showing It’s A Wonderful Life which is back by popular demand! Tickets for each evening are just £5 each! We’ll have mince pie’s for everyone, a professional photographer on site, discounted wines and beers at the bar and a chance for you to win a wonderful Christmas Hamper in our raffle! The theme for both evenings is ‘black tie’ and they will both start at 7.45pm although we’d love everyone to arrive early to enjoy the atmosphere! 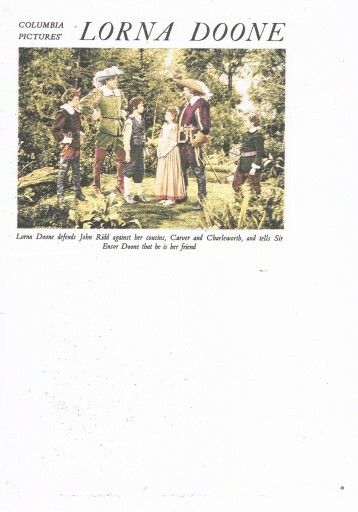 He sent representatives to England to scout locations that year and there was talk of a co-production with J Arthur Rank starring Louis Hayward to be filmed in Scotland. This project never seemed to get under way though. 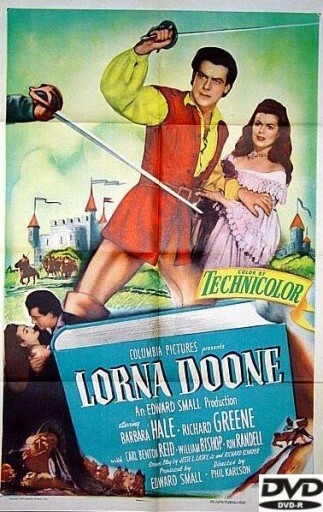 In 1948 Alfred Hitchcock announced plans to film the novel but Edward Small claimed he had registered the rights to the title in the USA so Hitchcock could film the story but not using the name Lorna Doone. This prompted Edward Small to announce he would start filming in England in association with Rank on 1 March 1949. 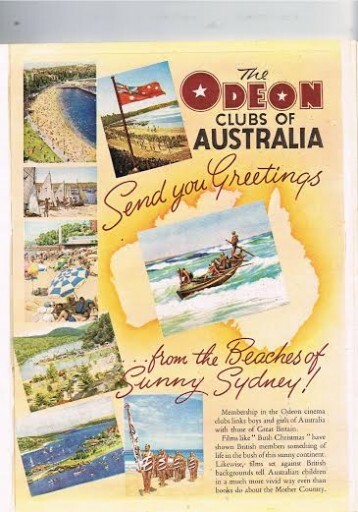 This was postponed due to financial constraints in the late 40′s just after the war. Above: Edward Small – Film Producer. The project however, was reactivated later in 1949 when Edward Small signed a two picture deal with Columbia Pictures, for Lorna Doone and The Brigand. It was then decided to make the film in Hollywood with English Actor Richard Greene – (who went on to star as Robin Hood in the very famous and successful 50′sTelevision series made in England ) and Barbara Hale. This page is from The Boys and Girls Cinema Clubs Annual of 1951. It is a lovely annual actually with many colour plates with items from films of the time – The Tales of Hoffman, King Solomon s Mines, Kim and a children’s film – The Case of the Missing Scene. However I also see a film called Wherever She Goes which is the real life story of Eileen Joyce, famous Australian pianist. Looks to be good from the pictures so I will do an article on this later. THREE Jungle Jim films have been shown today Saturday 6th December 2014. The thing that struck me was just how good the film quality was and also the production values were much better that I had thought they might be – in fact they were good !! 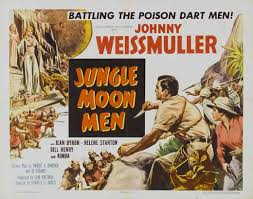 First film on was Jungle Moon Men 1955. 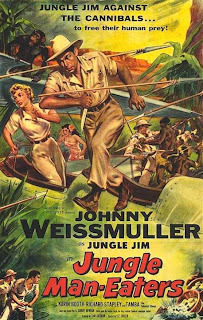 Although really a Jungle Jim film in this later one Johnny Weissmuller actually plays himself as just Johnny. The plot is the usual greedy white bad men seeking a fortune in diamonds in the jungle. The Moon Men of the films title are a jungle tribe who use as their weapons poisonous blow pipes and are quite scary but they come good right at the end. Quite an enjoyable film it was too. Then came Jungle Manhunt from 1951. This film had Bob Warfield a former American Football star – married to Jane Russell – along with Johnny and Sheila Ryan who had been briefly married to Cowboy star Allan “Rocky” Lane. 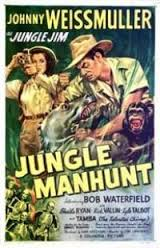 Jungle Manhunt is a 1951 adventure film In the story, football player Bob Miller (played by real-life footballer Bob Waterfield) gets lost in the jungle and is searched for by a female reporter who teams up with Jungle Jim. and the last of the THREE today was Jungle Man-Eaters 1955. This also starred Karin Booth and was 68 minutes of action where we see among other things Jungle Jim dive off a pier into the sea and swim out to a cargo ship anchored off shore – which is up to no good of course. Swimming back from the ship he upturns a boat carrying two of the men who are attempting to hunt him down – and there follows some quite impressive underwater scenes. The Jungle Jim films were mainly made at Corriganville which was named after its owner Ray “Crash” Corrigan former actor and stuntman. What was the Robin Hood Lake here has been recently renamed Jungle Jim Lake, and has a Stunt Rock from which Johnny Weissmuller dived into the water. 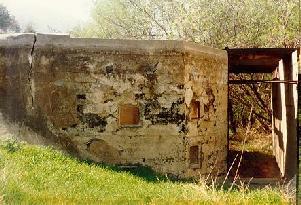 To allow for underwater photography, a camera house complete with window was built at one end. 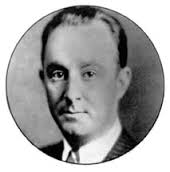 This camera house hidden under a bridge was a contribution of Sam Katzman of Columbia Pictures. It was undoubtedly cheaper than building a swimming tank on a sound stage. All the underwater sequences were shot here. The lake may have existed as early as 1938, and the Rock’s first recorded use was in 1943. 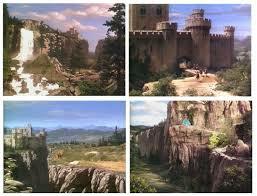 The first photo is Stunt Rock as seen in 1991; the second is a side view of Stunt Rock. The third photo was taken standing on Stunt Rock, and you can see what remains of the camera housing from which the underwater scenes of the Jungle Jim films were taken. And the fourth photo shows a space between a tree and a huge rock which was often used to simulate the entrance to a valley. 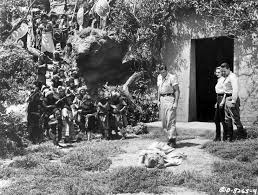 There was also a fake cave entrance built on the property, frequently used in the Jungle Jim films. It was first noticed in the filming of the serial Jungle Girl. The Fake Cave seen June 1999. The right side had originally been built up with plaster and cement, but disintegrated over the years. This is all that remains today. It appeared in Jungle Manhunt and Killer Ape, but not in Jungle Jim in the Forbidden Land as the sign in the park states. All interior shots were done on one of Katzman’s sound stages on the Gower Street lot. The signs at the regional park call this area the Jungle Jim pool. Jungle Jim is the main character in a series of action films (1948-1955) which starred Johnny Weissmuller. Scenes for these films were shot at the Corrigan ranch and in and around this pool. The artificial pool is concrete lined. The concrete room with windows housed the cameras for underwater filming (seen above). Above the pool is the Jungle Jim Dive Rock. This platform was constructed for easy and attractive looking dives into the pool. Information at the pool states that it was used for a variety of films including the Jungle Jim series, Creature from the Black Lagoon , and The African Queen , perhaps for some of the shots of Humphrey Bogart in the water. The now dry pond was used for boat rides at the amusement park (see below).